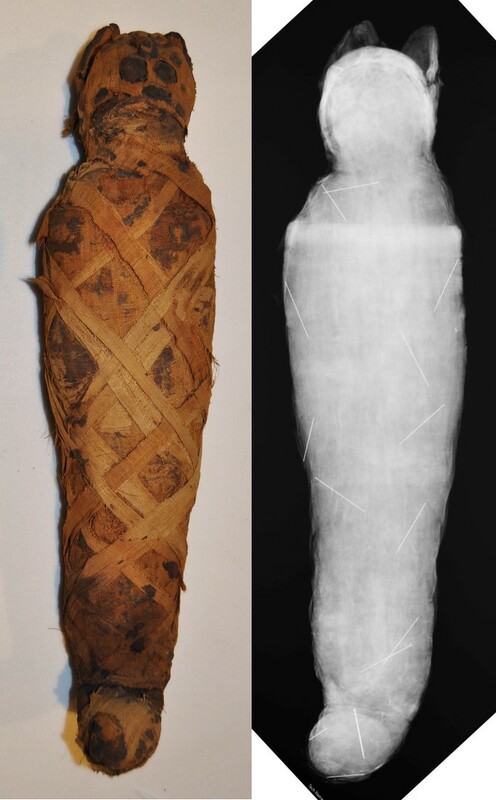 This is a follow-up to my last blogpost, where I posted some side-by-side images of animal mummies and their x-rays. In this post I’m going to explain what we think we’re seeing in the radiographs. This one is really easy. While the mummy is made to look like a cat, we can clearly see that there are no cat remains, or any remains, inside. All we see inside are very small straight pins, which were pushed into the linen wrappings in 1980 to keep them from unraveling. We know this happened in 1980 because it is noted in an old conservation report. A good example of an ancient “fake”! The next one is also fairly easy to interpret. We thought this was an ibis mummy, and sure enough, we see an entire ibis inside the wrappings. The GIF above highlights the distinctive skull and beak of the ibis in red. There are 3 baby crocodiles under the wrappings! The GIF above highlights the 3 skulls in red. Upon close inspection, we can see 2 separate, and very small birds inside. In the GIF above, the red outlines the skulls and beaks and the blue outlines the bodies. We don’t think that these birds are falcons, or even birds of prey at all. They look much more like doves or pigeons (based on examination of comparative specimens with zooarchaeologist Dr. Kate Moore). It’s possible that this mummy was never meant to represent a falcon at all – the jury is still out on this one. There is an animal inside, and it looks like its body is upside-down. It is very difficult to make out, but we can see its front teeth and its long tail. This one definitely called for the expertise of Dr. Moore, who brought up some comparative specimens from her collection. 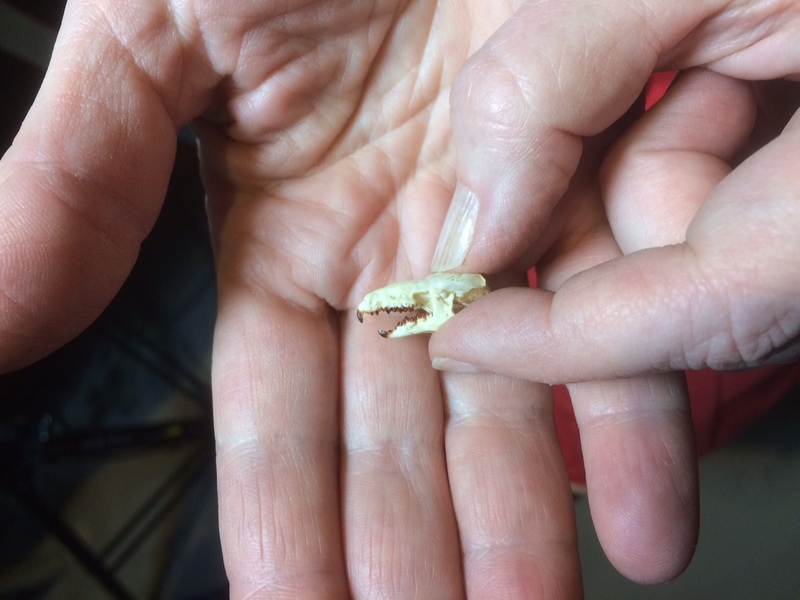 Ultimately, it was the teeth that convinced her that what we see inside this little mummy is a shrew. To the ancient Egyptians, the shrew represented the nocturnal side of Horus. Here is a link to an image of a similar shrew mummy in the collection at the Brooklyn Museum. We are working on documenting and examining the mummies and artifacts that came into the lab this week. We’ll be updating the blog as we learn more. In the meantime, we have updated our Currently in the lab page so you can get an idea of what there is to see in here at the moment. This crocodile mummy (E17631) is one of the newest additions to the lab. Questions? Comments? Please let us know by starting a discussion at the end of this post. Thanks!